We've made it to double digits! 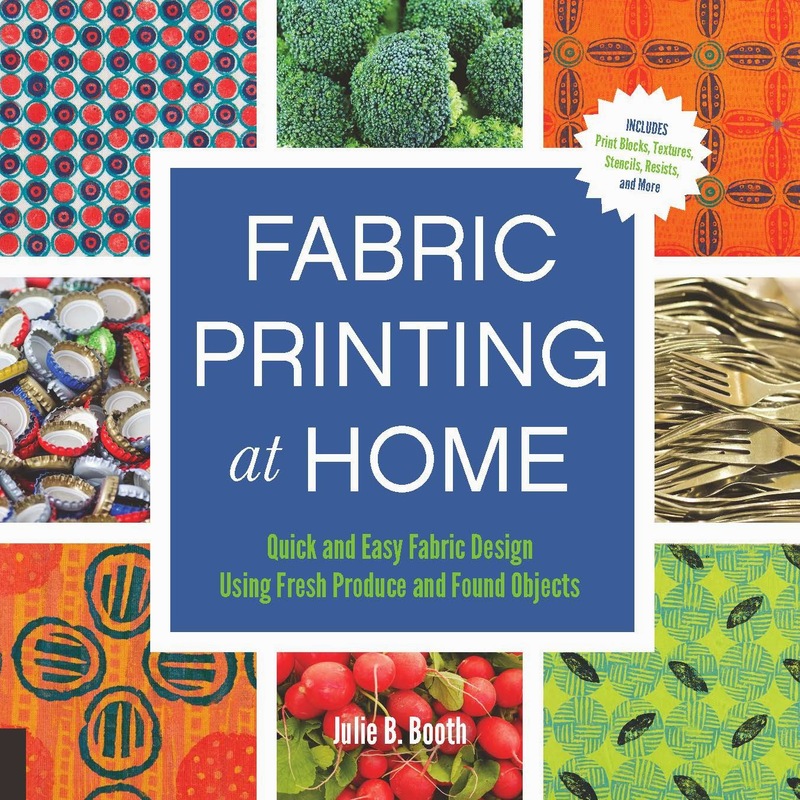 Welcome to Day #10 of the Fabric Printing at Home Blog Tour! 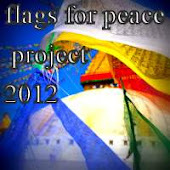 Today it's off to Deborah Boschert's blog. Deborah is a fellow member of The Printed Fabric Bee. I always enjoy seeing her approach to each month's fabric...she is also fond of using simple materials to create beautiful fabric designs. 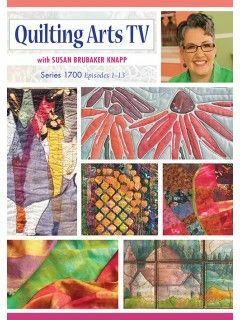 Stop by Deborah's blog today and leave a comment for a chance to win a copy of Fabric Printing at Home. Here are some quick tips I used when exploring the materials in Chapter 2: Kitchen Textures and Found Object Printing in Fabric Printing at Home. There were so many choices and layering possibilities using flat kitchen textures (such as shelf liner, textured placemats, gripper pads and netted bags), that I found the best way to keep track was to make a series of samplers testing them out. 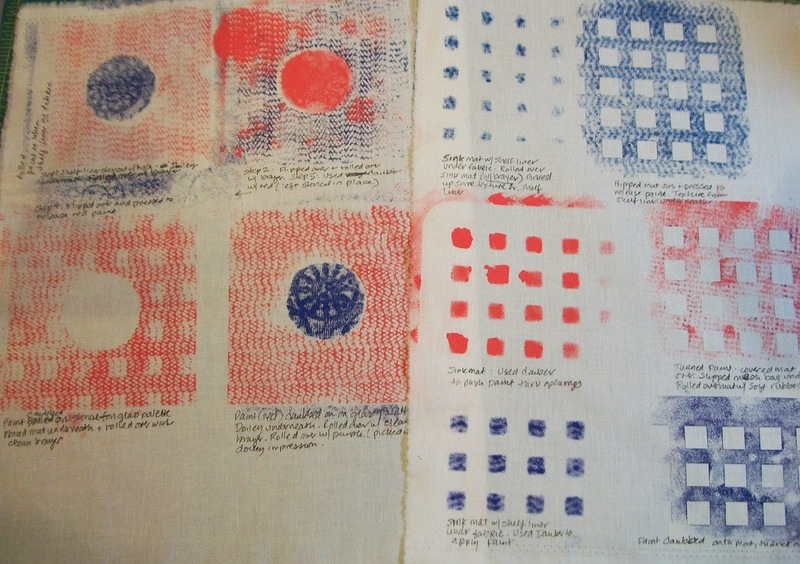 On each sampler, I wrote notes with a permanent marker to remind me which texture I used and the order in which I layered them. I also "took an inventory" of all the found objects I printed (e.g. bottle caps, batteries, pencil erasers, kitchen utensils). I took a close look at each object and asked myself, "Can I print with the top, bottom or sides of it? Can I roll it across the fabric? Is one part of the object more visually interesting than another?" Having a printed "record" of how I used these kitchen materials and taking notes makes these samplers a great reference that I can come back to again and again. Today's giveaway is (2) Pigma Micron Archival Marking Pens. These pens are great for making notes on your inventory samplers or adding a finishing touch to a fabric design. Leave a comment for a chance to win. I will choose a winner at 11:00 PM Eastern USA time. Check tomorrow's post to see if you are the winner. 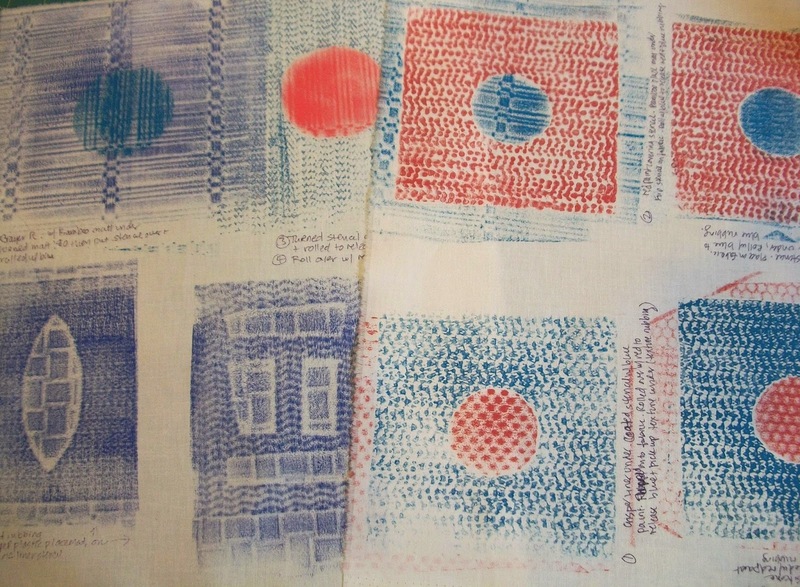 Your comment also enters you in the final drawing on February 15 for a free copy of Fabric Printing at Home: Quick and Easy Fabric Design Using Fresh Produce and Found Objects. And now for the winner of yesterday's giveaway (disappearing ink marking pen)...congratulations to Mary Ann of Blue Sky Dreaming ! Please email me with your contact information (threadborn@cox.net) so I can send off your prize. Tomorrow the tour stops at Lynda Heines. 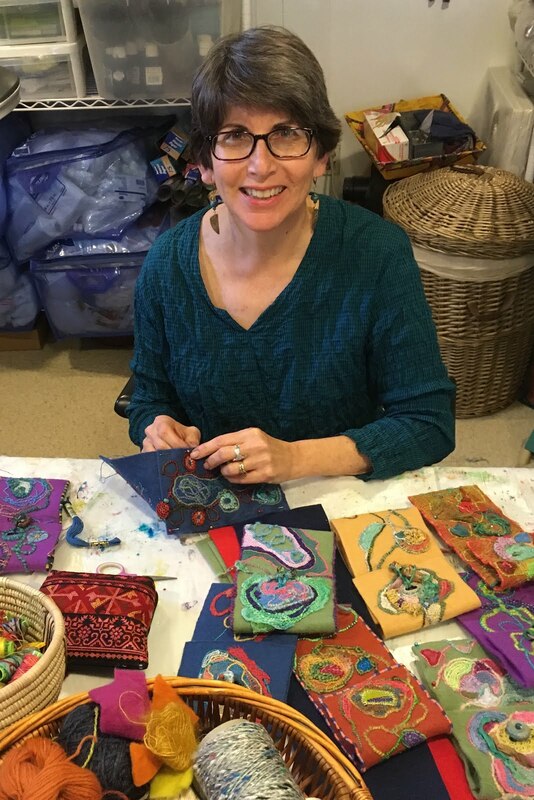 Lynda is an accomplished writer and fabric designer, I look forward to introducing you to her tomorrow. 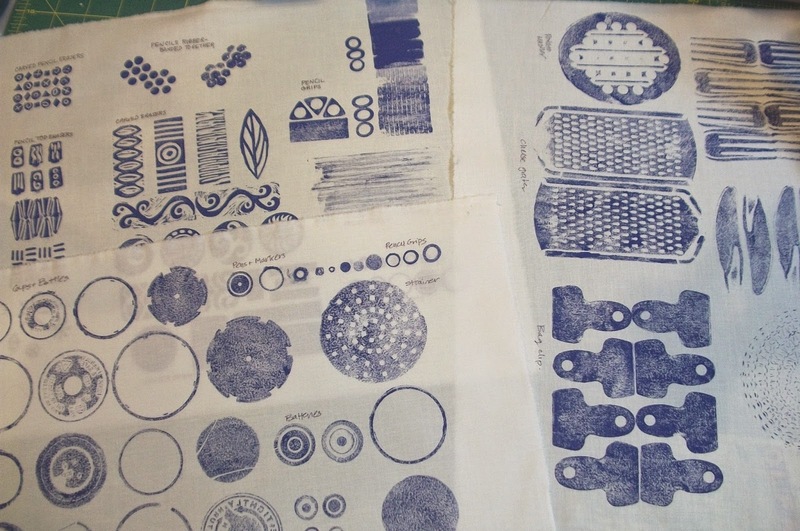 Not only kitchen vegetables, but kitchen utensils to print on fabric....my mental inventory of things to print with has just been squared! And making an actual record of print results is a very good idea. Julie, I am really liking this book and all your terrific ideas. Thanks, Lydia- the kitchen is truly a surface design "treasure trove"! You are so organized! I just play and never record and then wonder and can never recreate something I like. Thanks for the reminder that it pays to keep track of what you are doing! HI Kathy- Sometimes when you're in the middle of "playing" it's hard to stop and make a note and you don't always want to make notes on the fabric. In that case, I like to have my notebook handy (just a composition book) so I can jot down notes there. Your inventory is inspirational....best idea yet! Yours was the first surface design class I ever took, and whatever else I learned, I learned to label everything. I still do! It's a great habit ...makes it so much easier to reproduce an interesting surface design effect. Thanks for reminding us to write things down. I always intend to do this and metaphorically kick myself when I don't. Do you have a good way of keeping these experiments? Do you tape to pages and put in a book etc? A great reminder of something we should all do!! Good idea. It would be easy to keep a sketchbook close, printing and making notes on the fly. Maybe not the same as testing on fabric, but would serve the purpose of keeping a record! In addition to taking notes (and writing notes on fabric samplers), I always have my camera handy to document the process and the results. Your sample book is an artwork in it's own right. Very interesting visual display. The sample book is a great way to keep track of what marks you have made. I love your artful reference book! Wonderful idea of keeping an inventory of samples. I do it with FMQ samples, why not with printing samples...thanks for the idea and a chance at your book. These are some awesome ideas. Thanks so much for the inspiration! Hi Amy- Thanks for stopping by and commenting. Hope you had a chance to look at some of the other Fabric Printing at Home Blog Tour posts for tips and projects.